I just got my August Ipsy Glam Bag today, and to say I'm annoyed at how long it took to arrive is an understatement. This month's bag took a whopping 12 days to arrive from Georgia to California via DHL Global Mail. It took 4 days to be processed in Georgia, another day to actually leave Georgia, and then took 4 days to be transported to USPS from a mail center 2 hours drive away. I heard there was a problem with bags being properly sealed this month, so I was terrified I'd get an empty bag. Luckily, everything was there. Or not so lucky, if you got what I got. Here's the bag this month, and a lot of people really hated this bag, but I think I like it. It's a little wrinkly just out of the bubble mailer, but I think I will use this one. 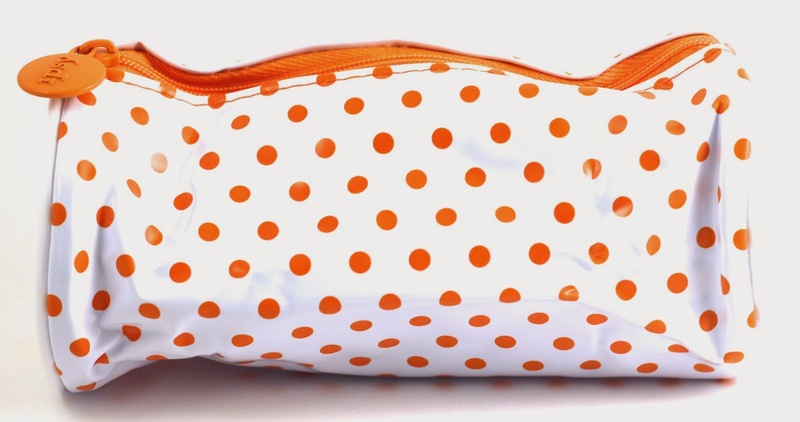 I do like that it's not just a rectangle bag like we were getting every month, and I do like the orange polka dots. Urban Decay Perversion Mascara - This was the one item I was really looking forward to trying in my bag this month. I have heard some people didn't like it, but I actually really love this mascara. It has the kind of feathery wand I tend to like, and the formula is not as wet as people made it seem. I've always been a fan of Urban Decay mascaras, so I probably would have bought this in full size anyways without sampling it, but now I know I'm going to buy the full size. 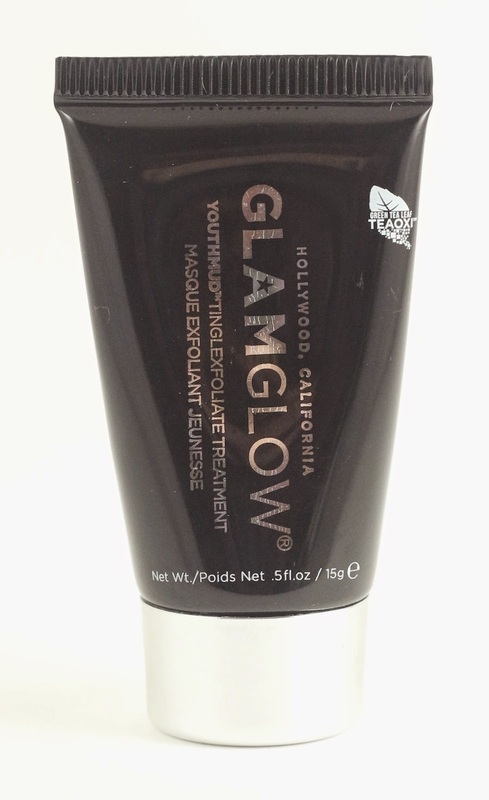 Glamglow Youthmud Tinglexfoliate Treatment - I haven't decided if I want to try this. I haven't heard the best reviews for it, but maybe I'll throw it in my stash. Manna Kadar Cosmetics Sheer Glo - I don't wear shimmer lotion. I don't think I ever will. There's just something about putting shimmery glitter on my body that revolts me in an OCD way. I just assume I will never get it off, and I'll have shimmer on me forever. I'm sure I'm just being weird about it, but after swatching it on my hand, the shimmer is very tiny and faint. I might try this mixed with some foundation to see how I feel about it. Jersey Shore Sun Mongongo Lip Conditioner - ($5.50) This is the only full size product in my bag this month, and it's a lip balm...and now you know why I cancelled. My products looked so teeny tiny in my bag this month, and while this lip balm is ok, the flavor is ok, it's nothing special. It will go in my stash of a hundred other lip balms I have. Lord & Berry Silk Kajal Kohl Eye Pencil - I was a little upset to be getting yet another black eyeliner, but now I'm actually considering keeping this. It's not the best eyeliner I've ever tried, but the line is very fine, and it isn't super mushy and creamy. I have some eyeliners that just melt in the heat, but this one holds up well. And it's so tiny that I may just throw it in my purse or use for travel. Overall, this was an ok bag for me, I found things in it I liked more than I thought I would, but I didn't even want to calculate the value for this bag or I would never get this review up. As I mentioned, this is my last Ipsy bag, so no more reviews, but I will still post the spoilers. Maybe if there is a product I really want to try, I'll just buy it instead of taking the gamble with a bag every month, and usually not getting the product I want to try. 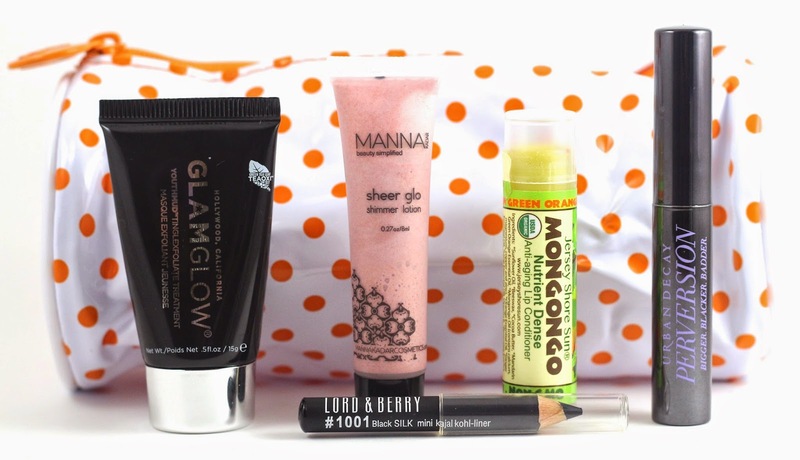 What did you think of this month's Ipsy Glam Bag? Let me know in the comments! Ipsy Glam Bag is $10 a month. They include 4-5 beauty products each month along with a cosmetic bag to carry all your goods in! If you haven't yet you can subscribe here! Is there another subscription that you think would be comparable or better for the $10 subscription price?